ON MY BUSINESS CARD, my title is listed as “Chief of Creative Strategies and Corporate Culture”. Yes, it is meant to be taken with a grain or two of salt and an eye roll, but it sounds much more noble than “Head Huckster in an Industry With Questionable Moral Redeeming Value”. In ninth grade English class, we were given an assignment: write a paper on what you would like to be when you grow up. I remember some of my classmates struggling with the assignment. When you’re 14 or so, and filled with bright hope and other stuff, it can be hard to narrow the possibilities for a life calling down to one job. For me it was easy. At that moment in time I had vocational clarity. I was to be a radio disk jockey. Even then I was certain I could stack the order of current hits to create a playlist that would not only wow and entertain but prove to be the soundtrack for young lovers everywhere. Of course, my commitment to being a great DJ would wax and wane, and my vocational vision would wander over the next few years, but never, ever would I have written an essay about being the marketing guy for a bank. But that all changed with my discovery of erlebnisgesellschaft. Agaraian economy: To make the cake, the mom gathers the necessary commodities and makes the cake from scratch. Goods-Based economy: Life gets a little easier. Now some lady named Betty Crocker has put a bunch of the key ingredients in a box called a cake mix. And last, but not least, the Experience Economy: Now you just outsource the whole thing to Chuck E. Cheese. Erlebnisgesellschaft, in theory, changed my perspective on marketing a bank—a part of an industry that has managed to turn even “service” into a commodity. Somehow it made the vocation seem more like a calling than a job. 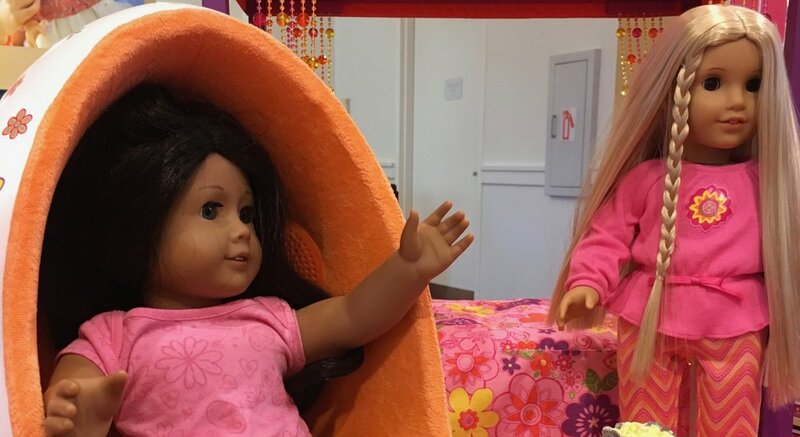 I thought we had made some strides toward this idea, until I visited the pinnacle of the Experience Economy model: The American Girl Doll Store. Our oldest Grand-Girl will be eight soon. (The recommended age for the AGD experience.) I had heard they stage quite the experience and I strive to earn the right to continue to drink from my “#1 Pops” coffee mug. So, let’s do this right. A Google search provided these tips: 1.) Make your bistro reservations before you arrive. 2.) Stay the night before your visit in a partner hotel. 3.) Arrive early and make your reservation at the spa first thing. Check, check & check! As we arrived at the “partner hotel”, the young lady at the desk looked right past me to Karlee, who was holding her American Girl doll. “This must be yours!” she says enthusiastically, as she hands Karlee a large AGD bag. As soon as we walked into our room, we noticed cookies and milk awaiting her arrival. She dug in to her bag to find a tiny little bed, satin sheets, a pillow, a robe and slippers all for her doll and hers to keep. There was also a $25 AGD gift card in the bag, to prime the pump so to speak.